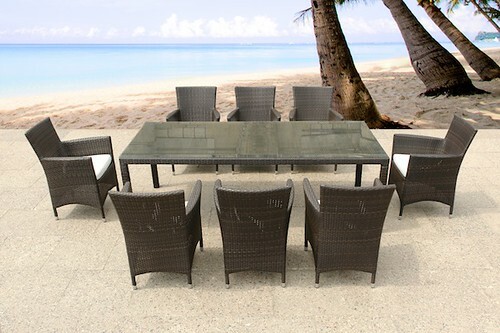 The outdoor dining set is the center piece of each home patio. Where else do you enjoy a nice meal with your family? Where would you sit down and relax to have a coffee of cocktail with friends or to read a book, and at the same time immerse in the sounds and scents your backyard has to offer? Trying to give you the best possible experience, designers strive to develop the most exciting patio dining sets. Among them Beliani with a new collection that offers o whole variety of different outdoor furniture, specifically there are two new sets in a more traditional rattan wicker design as well as a very modern outdoor dining set. Wicker was originally made from natural rattan fibers. Due to the maintenance that the material requires, manufacturers were quick to develop a synthetic alternative. 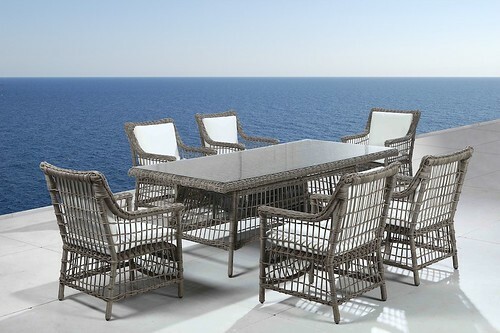 The rattan stripes in modern outdoor furniture are almost exclusively made from resins nowadays. While maintaining the qualities we love so much about traditional wicker – its natural visual appeal and its comforting elasticity – the resin wicker adds the component of easy maintenance. Most poly-rattans, as they are also called, are UV resistant, immune to water and frost, and 100% recyclable. All these factors have led to the huge popularity of wicker dining sets. But there is more. Even though it seems modern furniture has a harder time on the North American market than it does in Europe, e.g. modern outdoor furniture designs are hitting our store shelves. 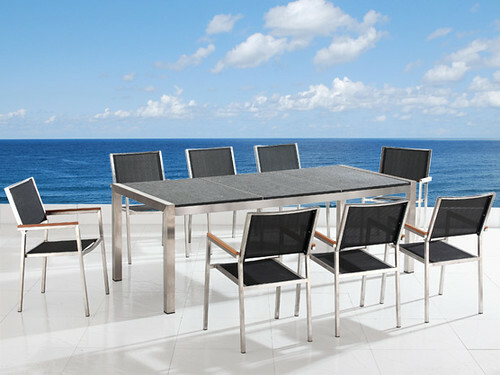 One of the very neat sleek designs is this Beliani outdoor dining set. Black flamed granite is featured on a stainless steel frame. Easy to clean and indestructable.